William Curry Holden. Image available on the Internet and included in accordance with Title 17 U.S.C. Section 107. Holden's doctoral dissertation, Alkali Trails, published in 1930. Image available on the Internet and included in accordance with Title 17 U.S.C. Section 107. 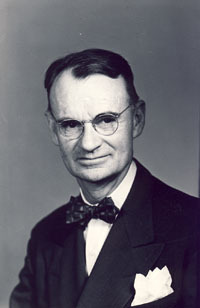 Curry Holden authored or coauthored more than twelve books and forty-two articles and pamphlets in professional and commercial journals. Four works focused on the Yaqui Indians. Hill of the Rooster (1956) was his only novel. It treats the life of a woman called Chepa during the Yaqui rebellion of 1926–27. Yaquis praised the book as the most accurate portrayal of Yaqui life at that time. Holden also wrote Teresita (1978), which describes the life of Teresa Urrea, a Mexican folk healer. Holden's Yaqui interpreter, Rosalio Moises, recounted his life for A Yaqui Life (1971), which Holden and his daughter, Jane Holden Kelley, coauthored. 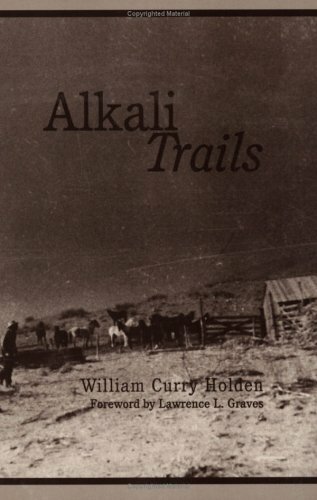 Other books written by Holden include Alkali Trails (1930), Rollie Burns (1932), and Spur Ranch (1934). Gravestone of William Curry Holden in the City of Lubbock Cemetary. Courtesy of Find a Grave. Image available on the Internet and included in accordance with Title 17 U.S.C. Section 107. Ruth Horn Andrews, The First Thirty Years: A History of Texas Technological College, 1925–1955 (Lubbock: Texas Tech Press, 1956). "Book Notes," West Texas Historical Association Year Book 69 (1993). Dallas Morning News, April 24, 1993. William Curry and Frances Mayhugh Holden Collection, Southwest Collection, Texas Tech University. Lubbock Avalanche-Journal, April 22, 25, 1993. Jane Gilmore Rushing and Kline A. Knall, Evolution of a University: Texas Tech's First Fifty Years (Austin: Madrona, 1975). Who's Who in America, 1962–63. Who's Who in the South and Southwest, Vol. 7. Handbook of Texas Online, Frances Mayhugh Holden, "HOLDEN, WILLIAM CURRY," accessed April 26, 2019, http://www.tshaonline.org/handbook/online/articles/fhokq. Uploaded on June 15, 2010. Modified on August 19, 2016. Published by the Texas State Historical Association.